This pasta sauce is AMAZING. Creamy and tangy and slightly sweet. And it's made from just the simplest of ingredients: a bit of olive oil, a vine ripe tomato, and fresh goat cheese. Season it up and you have a sauce that's better than fatty alfredo (IMO) without any of the butter or cream. You've gotta try it! I topped whole wheat fusilli pasta with the sauce and spiced chicken (prepared with S&P, basil, oregano, & garlic powder) and served it with a side of squash and zucchini. You could eat this is in so many different ways though -- add the veggies directly into the sauce; top with shrimp; eat it meatless and stir in some broccoli instead; add some sundried tomatoes and olives... the possibilities are endless. 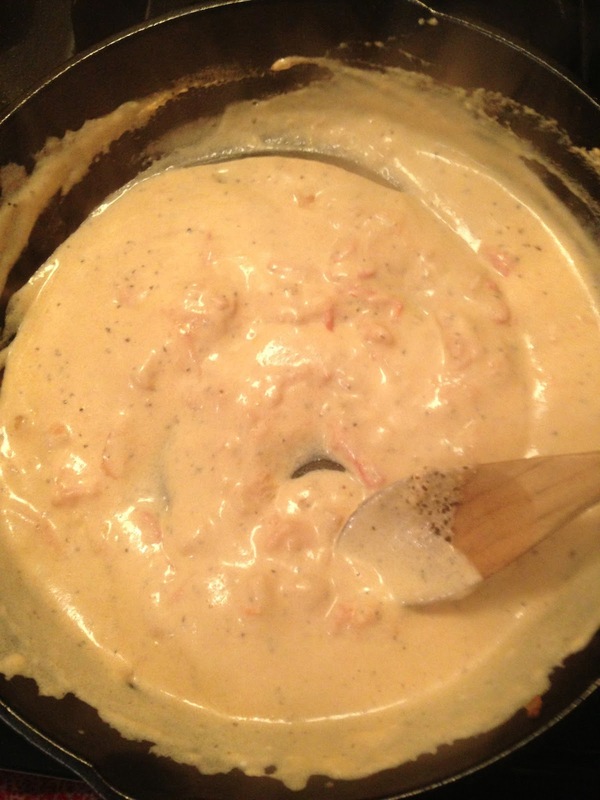 I was focusing on perfecting the sauce so I kept the rest of the dish simple. Mission accomplished! This stuff rocks. Heat a tablespoon of olive oil over medium high heat. 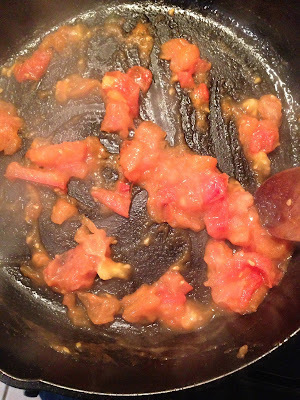 Add in a diced, ripe tomato. Meanwhile, prepare your pasta (I used whole wheat fusilli - penne would be great too) and your spiced chicken. 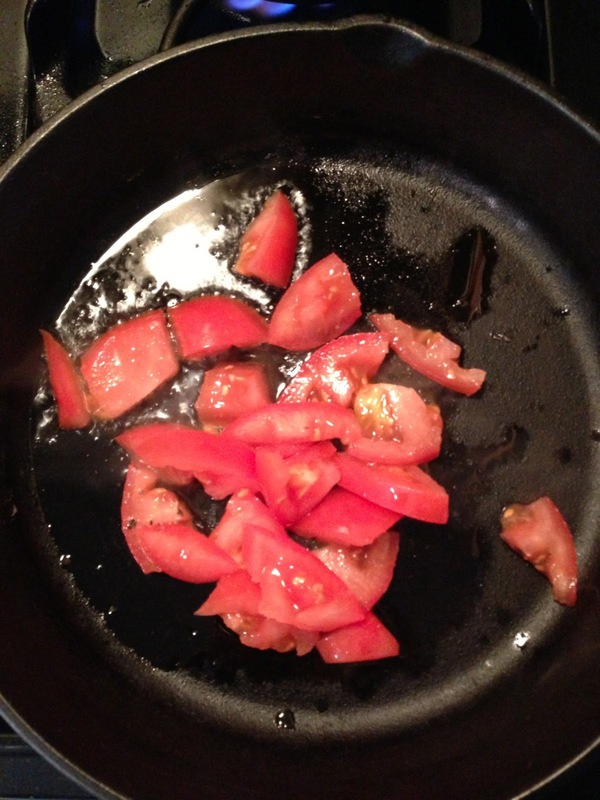 Cook the tomatos, stirring regularly, until they start to soften. 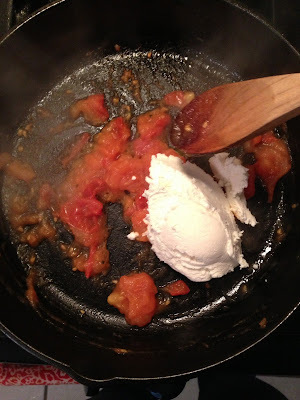 Continue stirring, gently crushing the tomato with your spoon until it becomes paste-y. At that point, stir in about 4 ounces of goat cheese. Reduce heat to medium low and gently stir, allowing the goat cheese to melt. Now, scoop out half a cup of starchy pasta water from your cooking pasta (or if you've already drained the pasta, be sure to reserve that half a cup before discarding the pasta water). 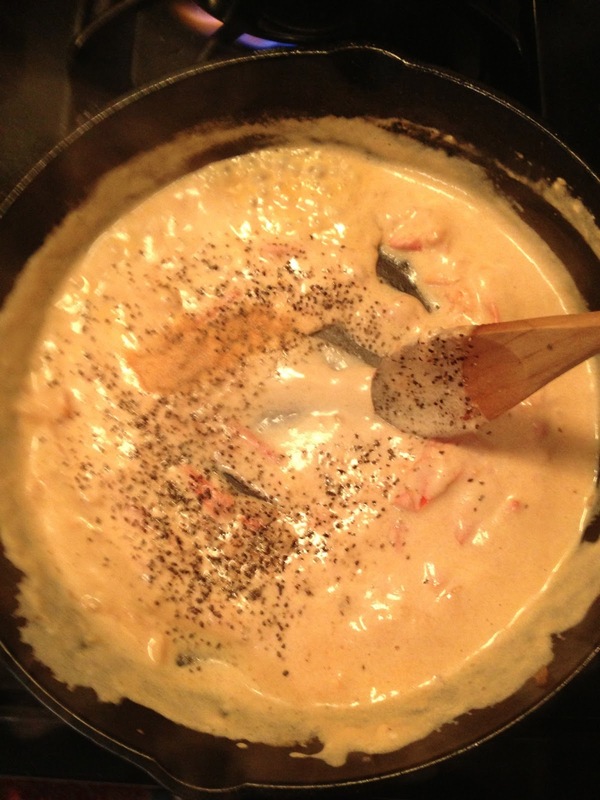 Slowly add in the pasta water, bit by bit, stirring constantly. Reduce heat to low. Add in some spices: garlic powder, salt, and pepper. That's it! Wait until you taste it. Serve over the al dente whole wheat pasta. Top with chicken alongside some veggies for a fresh, well-balanced, natural meal. Yum! -Prepare pasta according to package directions, being sure to reserve half a cup of starchy pasta water before draining. -Meanwhile, heat olive oil over medium high heat in a heavy-bottomed skillet. 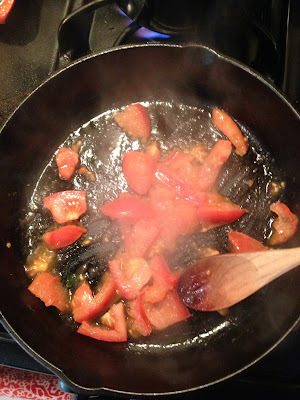 Add tomato. Cook, stirring regularly, until tomato starts to soften. Continue stirring, gently crushing the tomato with your spoon until it turnes into a paste-like substance. Stir in goat cheese. Reduce heat to medium low. Stir gently until goat cheese starts to melt. 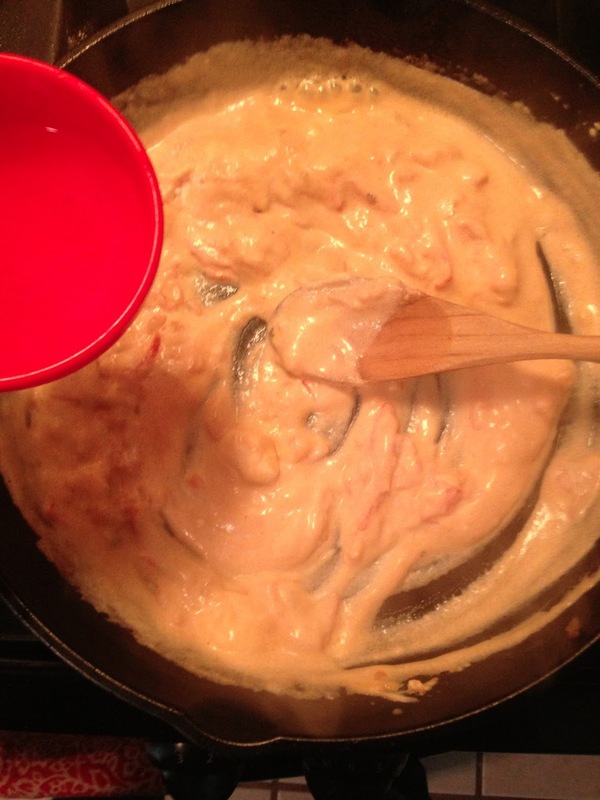 Scoop out 1/2 cup starchy water from cooking pasta (or use reserved if you already drained). Slowly add in the pasta water, bit by bit, stirring constantly. 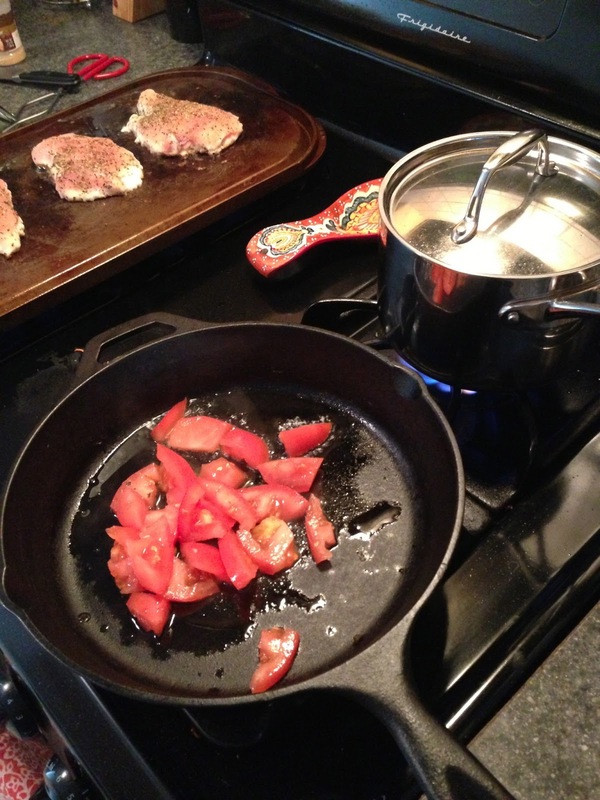 Once desired consistency is reached, reduce heat to low. Add in spices. 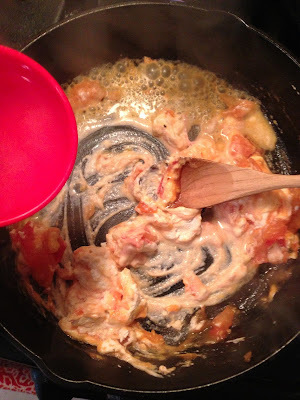 -Serve sauce over cooked pasta. Top with spiced chicken.